Hello Girls, how have you been ?? Lately, i am not writing much posts ... its like i was depressed or tensed or something ... Today, i am feeling quite a relief as if all the problems are gone (Although i dont know why i was tensed) so i decide to share with you something which i find quite useful. Being a nail art lover, I am always searching for efficient and easy ways to do my nails. We, women know that it takes time to paint your nails. Not only to create designs but to let them dry also, so who would really want to spend the same amount of time on removing it? None I think. What I love most about this method is that it doesn’t mess with your fingers but the acetone only touches your nail and that is a great thing when it comes to beautiful hands. For making this you will simply need cotton balls and acetone/nail remover . And of course to follow the steps shown in the picture below. 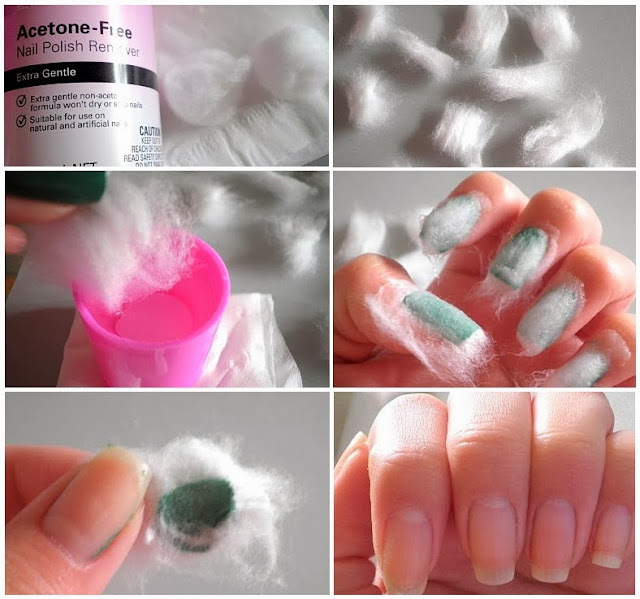 Start by making small stripes wit cotton balls and then wet them with acetone. Put the wet cotton ball over your painted nails and leave it there for about 2 minutes. After cleaning one hand, apply it on the other hand also. As you can see it takes 2 minutes for each hand, which means less than 5 minutes. Try it, and you will thank me, I know you will! I don’t claim to own or invented this method but important is I decided to share it with you all; Enjoy and have fun doing it. What a great idea! I will have to try this out this weekend. Thanks for sharing. Your blog has been accepted in Asia Pakistan N° 106 a minute! wow!never knew about this and this is perfect!